Businesses that license Microsoft Office company-wide are wasting money because few employees actually make significant use of the programs, according to the results of new app usage study. According to a report by John E Dunn for PC World, startup firm SoftWatch has been studying how employees use Office apps and concluded that many businesses can save significant resources by switching from Office to cheaper cloud-based applications. SoftWatch said that in a study of 148,500 employees across 51 international companies that licensed Microsoft Office, 70 percent of employees were only using the productivity software for viewing or light editing. "What the study seems to be telling us is that the age of the all-purpose Office suite based on monolithic licensing has probably had its day because most users simply don't use applications often enough to justify the cost." - John Dunn, SoftWatch. The majority (68 percent) of the total minutes that employees spent interacting with Office on a daily basis was consumed by Outlook email, which accounted for about a half hour of the average employee's day. Another 8 minutes per day were spent interacting with Excel, five minutes in Word and two minutes in PowerPoint. Among employees in general, 29 percent either never used Excel and Word or only ever used them to view existing documents, while 70 percent never needed to edit a PowerPoint document. An additional 62 percent made only light use of Word (leaving 9 percent making more serious use of it), while 53 percent made only light use of Excel (leaving 18 percent who were significant number crunchers). "What the study seems to be telling us is that the age of the all-purpose Office suite based on monolithic licensing has probably had its day because most users simply don't use applications often enough to justify the cost," Dunn wrote. The company behind the study sells its app usage analytics to companies as a way to determine their actual needs for licensing Office, and it partners with resellers of Google Apps, which it recommends as an alternative. Microsoft appears to be well aware of the fact that its customers have other options, including cloud-based 'Software as a Service' offerings. 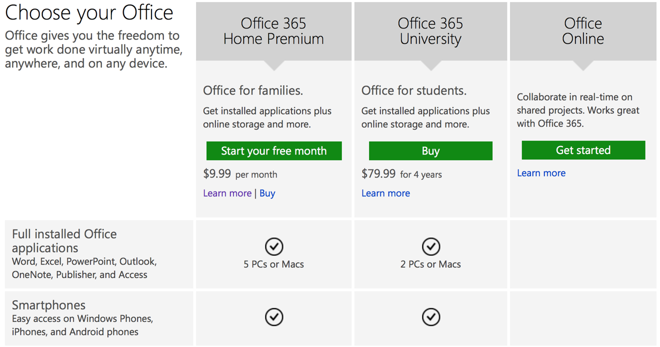 The company now sells Office 365 as a subscription service that provides a company's employees with flexible access to Office apps via native Windows, Mac, Android or iOS apps, including a new touch-oriented version of its Office apps tailored specifically for, and currently exclusively for, Apple's iPad. Microsoft's Office 365 subscription covers the unrestricted use of those apps, while users with only casual needs for viewing documents can download Microsoft's new iPad apps for free, with no other licensing required. Still, the idea that SoftWatch is establishing a business around the idea of evaluating employee use of apps that were once considered "required for business," and that it is in general recommending that users ditch Office to save money, appears to reflect an enormous shift from the status quo, on parallel with the "Bring Your Own Device" trend that forever changed the amount of control that centralized IT Management dictated over the productivity tools employees used. Outside of workers tied to the conventional PC desktop office environment, mobile users (and conventional office users making any use of mobile devices) have decisively gravitated to Apple's iOS platform, in the form of iPhones and iPads. For the most recent winter quarter, enterprise Mobile Device Management vendor Good Technologies reported in February that 73 percent of all mobile devices its clients were using were iOS devices. 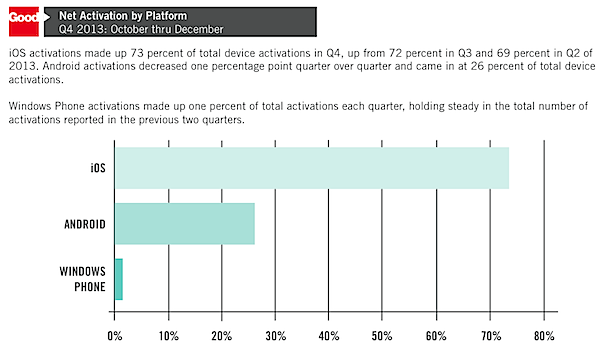 Among tablets, the ratio of iPads was even higher, now claiming a 91.4 percent share of all business tablets. Apple's share of tablets has remained sky high ever since the iPad was first released in 2010, meaning that enterprise users have been standardizing on iPads for over four years now. As Microsoft delayed in releasing a native edition of Office for iPad, enterprise and education users have migrated to apps that were available for the popular tablet, including the iWork productivity suite that Apple launched alongside the original iPad in 2010. A study published last year by Citrix indicated that Apple's Numbers and Pages were among the top enterprise apps, with Numbers being fourth on the list, and Pages coming in behind tenth place iBooks. The other office suites, Docs2Go and QuickOffice, ranked behind Apple's iWork. Citrix is used to provide mobile access to Windows desktops, meaning that Citrix users who were installing and using Numbers and Pages were doing so because they preferred working in local, native apps. A year later, Microsoft has launched its Excel, PowerPoint and Word titles on iPad, and appears to be seeing significant adoption among iOS users, judging by the popularity of Office titles in the App Store. However, the company--which once ruled business productivity software--now faces stiff competition from a variety of free apps. 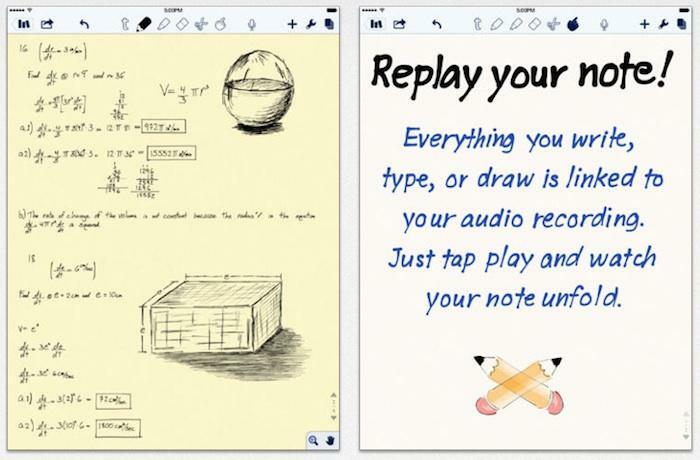 The top free iPad productivity app is currently Notability, a clever word processing app (below) that allows users to type notes or sketch ideas in ink while recording audio; the app then connects the playback point of the audio with the notes as you take them, allowing you to review what was being said as you took your notes. Behind Notability is Google Docs, followed by #3 Word, and Apple's Pages at #8. For spreadsheets, Google Sheets is the fourth most popular free productivity iPad app, followed by Excel at #5 and Numbers at #9. Microsoft Powerpoint is currently at #6, followed by Apple's Keynote at #10. In addition to a series of innovative new independent productivity apps, Apple, Google and Microsoft have all recently brought to market enhanced new versions of their productivity suites. Each has also enthusiastically adopted Apple's iOS App Store software model in delivering rapid updates at low cost; creating easy to use apps with simple interfaces that don't require extensive user training; and making extensive use of modern app features such as automatic saves, collaborative editing and cloud-based storage.